Its the last lot of CIH classes for 2014 also SUP classes it has been one busy Term 4. 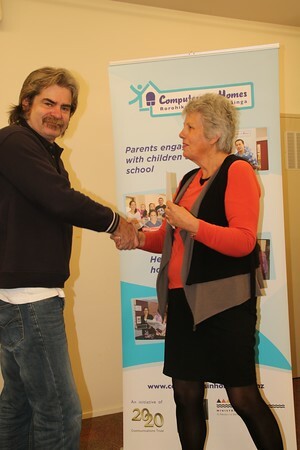 We have had 5 CIH classes a week this time around 3 in Masterton,1 in Featherston and the other in Dannevirke so we will graduate 35 for term 4 plus we will certificate 12 people for SUP who have done at least 4 or more modules. What my people do after their CIH classes is they just turn over to SUP after their graduation which is really good. These 2 are discussing how to do what they are learning. Michael Whitelock and Annette Peters are having a discussion on how to do what they have to do by reading their sheet. These 2 photo's are both from Douglas Park School. These 2 lovely ladies are concentrating on doing the Spreadsheet part which is part of their learning by doing up a finance sheet for themselves. The next 2 photo's are from Ko Te Aroha which is a Thursday afternoon class. I don't know wether these 3 are looking at something on their computer or thinking about how to get started on what they are going to learn on this lesson. They look very serious. Mac Haira (in red) is making sure his buddy is doing what he showed him do on the lesson they are learning. One thing i love about this program is that when we come across clients that are faster at picking up on what they learn and then we have some that are not so quick then you see them all helping one another to bring them all up to same level as each other.